Essential Foundation for High School English New workbook from Seton Press. 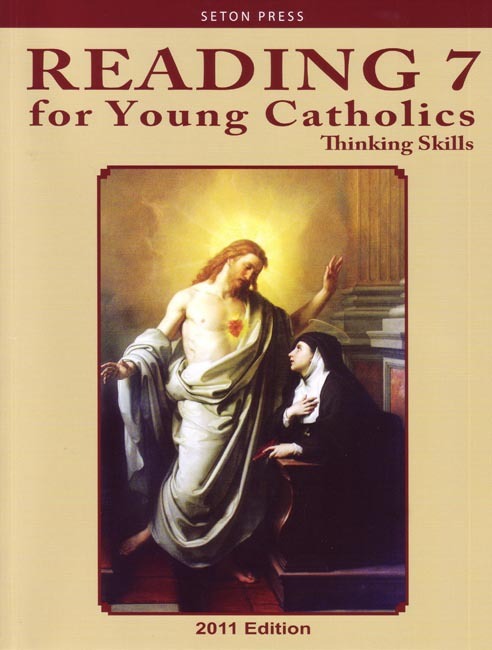 Lessons are comprised of two sections each: one excerpt from classic literature, and one from the life of Sr. Margaret Mary. Sections are followed by questions which focus on drawing logical conclusions from the text. Black and white illustrations by Ben Hatke. Answer key included in back of the book on perforated pages for easy removal. 2011 copyright. 8.5 x 11 inches. Soft cover. 114 pp. My daughter has never enjoyed reading, especially comprehension book assignments. However, this workbook caught her interest. The classic literature stories really allowed us to have some interesting and exciting discussions which, in years past, we have never experienced, because she simply wanted to be done. This year the presentation of the various elements of a story, such as theme, plot, and characterization, were done in a very clear-cut manner. Both of us enjoyed the ease with which she completed each assignment.